The 20th annual Virginia Biological Farming Conference is Virginia’s premier organic and sustainable agricultural conference! The Virginia Association for Biological Farming (VABF), Virginia State University (VSU) and Virginia Cooperative Extension (VCE) collaborate to bring together farmers, gardeners, eaters, educators and advocates of sustainable agriculture for 2 full days of educational workshops and presentations, panel discussions, interesting and knowledgeable exhibitors, locally sourced meals, book signings, Silent Auction, Taste of Virginia Social and lots of networking opportunities! Join us Saturday and Sunday, January 12 & 13, 2019 for our full lineup of events at our 20th annual Conference, immerse yourself in our Pre-Conference intensive workshops on Friday, and celebrate at the Taste of Virginia Social on Saturday! All Conference Registrations include lunch and dinner on Saturday and lunch on Sunday. Registration sales are final. Email Lindsay at coordinator@vabf.org with conference and registration questions or call 540-974-5767. Book your room at the beautiful Richmond Omni Hotel, overlooking the scenic James River in the vibrant Shockoe Slip Historic District. Rooms include free wi-fi and valet parking. Join VABF or renew your membership here! Current members: Simply request your password and/or sign in here! *Note that Farm/Household members may purchase registrations for up to 5 farm/household members and Non-profit organization and Business Members may purchase up to 4 member registrations for their organization/company. 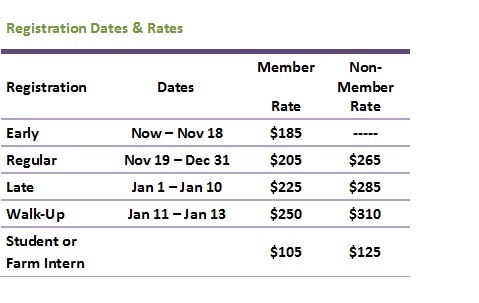 Individual members may purchase 1 Conference registration at the member price. Pre-Conference Intensive workshops are on Friday, January 11, 2019.
with Tricycle. Includes lunch provided by Friendly City Food Co-op! Includes lunch, materials and certificate. Only $30! Payment by check or money order may be made by submitting your registrant information below and then choosing the ‘Pay by check or money order’ option.